Winter driving is extremely dangerous. Drivers of all different types of vehicles can quickly forget how much the winter weather can impact the roads, making it a necessity for taking more precautionary measures. However, it is unfortunate that oftentimes drivers do not account for the need to have good maneuvering skills, realizing the necessity of longer stopping distances, and being able to handle skidding. In addition to that, there are the preventative measures that should be taken into account including winter tires, chains and keep lights and windshields clean for the best visibility possible. It is truly the forethought, skill, preventative measures, and knowing when conditions are too dangerous for driving that separate professional drivers from the rest. Truckers routinely carry large capacity loads, but foul weather changes how the load handles. Therefore, when you are driving in snow and ice, take extra caution to avoid dangerous mishaps. Be sure to keep a safe driving distance from the vehicle in front and beside you in bad weather, distancing yourself one-quarter mile if possible. This allows ample stopping distance if the need arises. Also, wintry weather means maximum speed limits no longer apply. Regardless of the deadline you have or how confident you feel as a driver, you can never know what may be ahead, and if you are following someone too closely, a mistake they make, could quickly impact you if you are driving too close. Driving in winter weather is a very broad term and conditions could change rapidly. Do not get complacent or become overly confident by thinking you can predict what is ahead or that you have the experience to handle any possibility. 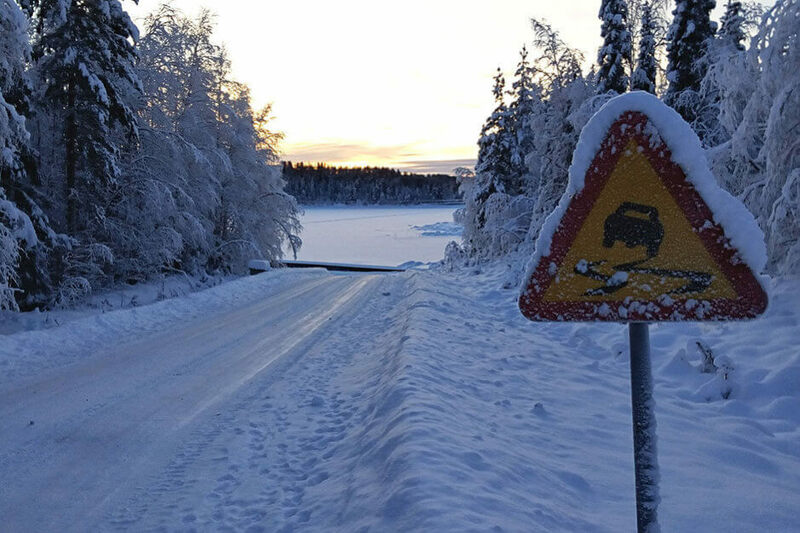 Winter conditions could mean a few icy patches on the road, to snow drifts, solid sheets of ice or complete white out. And while, you may be driving safely overall, it doesn’t mean other drivers on the road are as sensible. Be cautious and attentive, realizing that there could be an array of possible scenarios ahead. 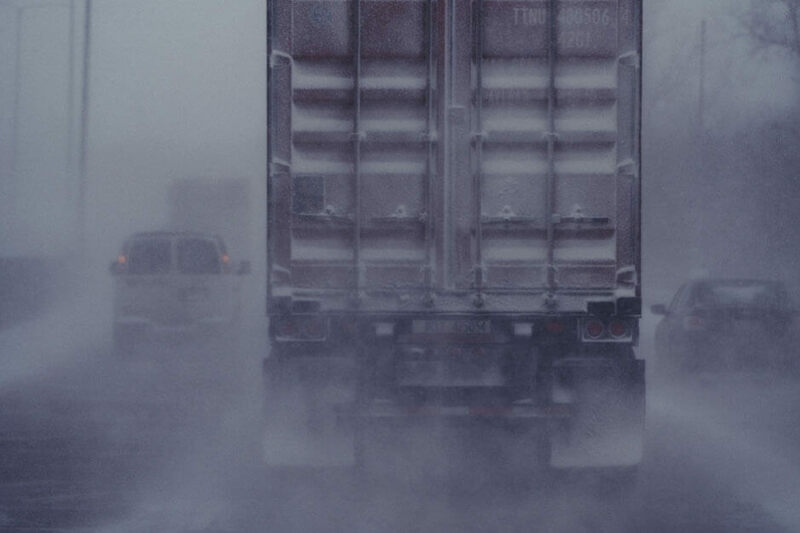 While an emergency supply is mandatory for most truck drivers, be sure to make additional preparations if you are heading into winter conditions. During long hauls, your rig is your home, your workplace and your livelihood. Prior to heading out, verify fluids are topped off and ensure that the heater, defroster and lights are properly working. Check tire pressure and adjust it for the winter driving conditions to have the best traction possible; bottom line, be extremely attentive during the circle check. Keeping your gas tank full is not only a safe practice in preparing for the unexpected, but during bad weather, the weight of the fuel also increases traction, which equates to more stability on the roads. Winter conditions make the roads even more dangerous and watching out for everyone else on the road becomes even more necessary. Out of town travelers and individuals making their daily commutes seem to habitually be oblivious to dangerous weather conditions Regardless if it is due to inexperience or being too rushed to care, oftentimes the carelessness of other drivers endangers everyone, which means having a more watchful eye is imperative. In addition to watching out for others, it is just as important to watch out for yourself. Know when the driving conditions including road, temperature and visibility are too dangerous to continue. Staying safe and alive takes precedence over everything else, including a delivery deadline. If you are a driver who takes pride in making every delivery on time or ahead of time, this may be especially difficult for you, but it is not worth putting yourself at risk. No when to stop because your life and the lives of others could depend upon it. Braking habits must be carefully monitored during winter driving conditions. For instance, while some truck drivers would insist that the jake brake is the “go-to” for icy conditions, refrain from using it, as it could result in a dangerous jackknife or spinning out of control. Another braking mistake to avoid during snow and ice is the failure in properly judging distances. Refrain from braking suddenly as this could result in skidding and the brakes locking up. Winter road conditions effectively decrease tire traction, so be sure to increase the distance in which you trail another vehicle. Be sure to avoid the roadside and shoulder during winter weather. Stopping and parking in these areas pose extreme danger for other drivers, especially during low visibility. To better ensure your safety and the safety of others out on the roads, rather than stopping along the shoulder, pull into a safe parking area or the nearest weigh station. Intersections: Start applying brakes sooner during bad weather to prevent accidents. Bridges: These are notorious for being more dangerous than other parts of the road. 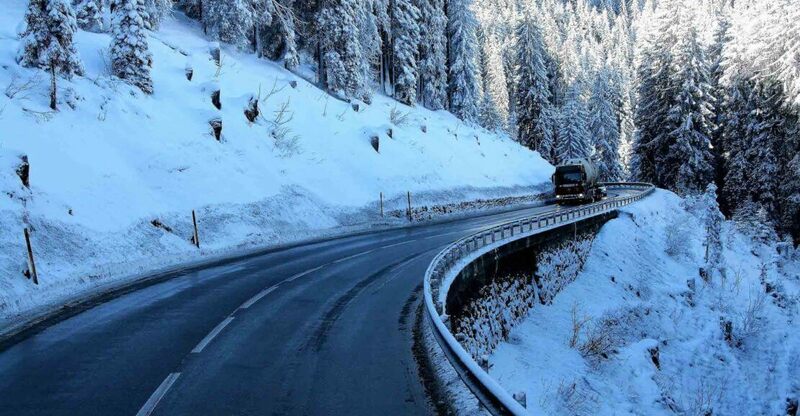 Mountainous Areas: A slight difference in elevation can equate to a big difference in road conditions. Stay alert as you approach these areas. Windy Areas: While high winds can always pose danger, during snow, windy areas are a prime location for white out meaning visibility can be drastically reduced. 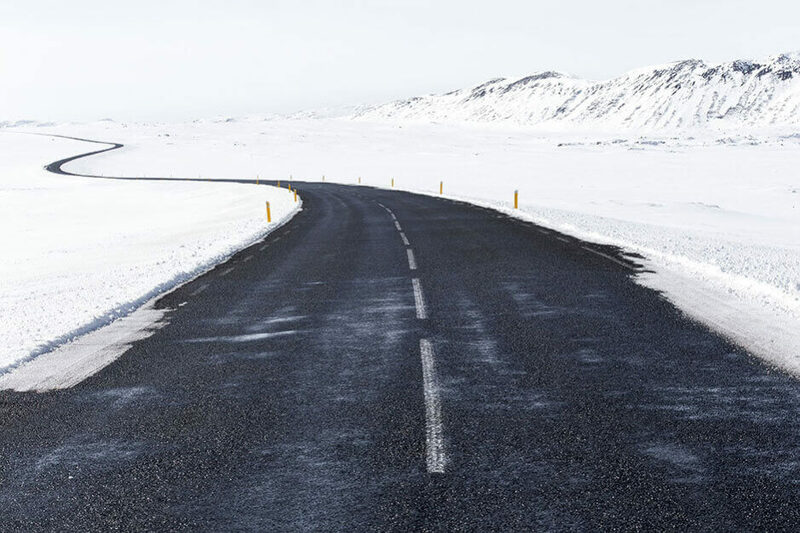 Black Ice: When driving in an area with freezing temperatures, black ice can occur in shady areas of the road; looking like nothing more than a wet road, it can quickly send you spinning. Exit Ramps: Slow down on exit ramps and avoid sharp turns that could cause loss of steering control. 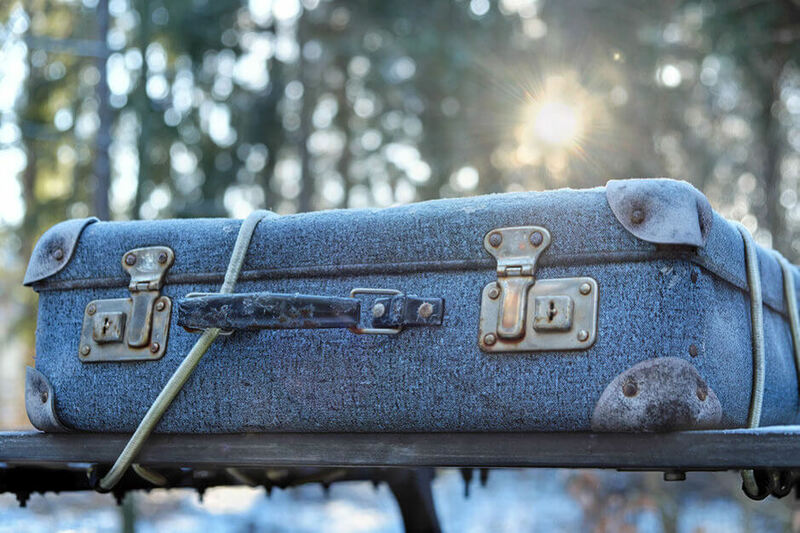 Weather patterns can change suddenly, so be sure to adjust your driving habits to accommodate for snow, ice and freezing rain during the winter months and stay safe out on the roads. Sign up for our newsletter so you will have the latest news and helpful tips sent straight to your mailbox! Don’t let the busyness of life cause you to miss out on what is happening around you. Our newsletter is comprised of stories, handy advice and lots of relevant insider information. Suppose U Drive, has been serving the trucking industry for more than eighty years, so we are experts in the industry, know what our customers like and want to share meaningful insight whenever we can. To sign up, click here.